In this guide you will find the information required to make a purchase at BYDealers auctions. Further details can be found in the Terms and Conditions of Sale section. If you would like additional assistance with this process, please contact us at 1 888 399-7856 or 514-274-2606. BYDealers charges a 20% buyer’s premium on the hammer price of each lot sold. The buyer’s premium is payable by the winning bidder, in addition to any applicable sales taxes. 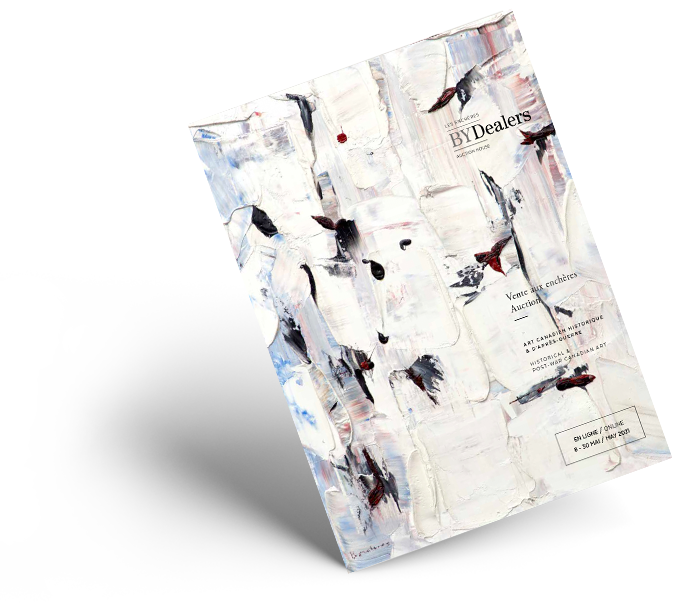 You can peruse the artwork to be auctioned by browsing our bilingual catalog which includes descriptions highlighting relevant information about each work of art. To access our catalogue online, click here. If you wish to receive a print version of our catalogue, please submit your request here. Before each auction, BYDealers will exhibit the featured artworks, both in Toronto and Montreal. These exhibitions are open to the public and are free of charge. There are four ways to place bids at BYDealers auctions: in person, by telephone, online, or by absentee bid . Official proof of identity with photo is required to register. A bank reference or credit card pre-authorization may also be requested. To bid in person, you must request a paddle number before the sale. New bidders are encouraged to register at least 24 hours before the auction to allow time for pre-approval. To bid online, you must create an account and register for the auction to receive your digital participant number. During the auction, you may bid in real time while watching a live stream of the auction. To use this bidding option, you must register at least 24 hours before the auction to allow time for pre-approval. If you simply wish to watch the live stream of the auction without bidding, registration is not required. If you are unable to attend the auction in person, you may bid by telephone with the assistance of a member of our bilingual team. To do so, you must make an appointment at least 24 hours before the auction. Since the availability of this service is limited, we recommend that you place your request as early as possible (first come, first served basis). In the event that we cannot reach you, we advise that you communicate your maximum bid amount to us (before buyer’s premium and taxes), so that we may bid on your behalf. If you are unable to attend the auction in person and cannot participate by telephone or online, BYDealers may execute a purchase order on your behalf. By placing a purchase order (in Canadian dollars) at least 24 hours prior to the auction, BYDealers will bid on your behalf to purchase the lot at the lowest possible price considering the other bidders and the reserve, and respecting the maximum amount you indicated in the purchase order (excluding the buyer’s premium and applicable taxes). $3,000,000 + At the auctioneer’s discretion. • Visa, Mastercard, or Union Pay up to a maximum of $50,000 per customer per auction. To pay by credit card, the buyer must appear in person with the credit card and a valid photo ID. A 2% surcharge will be added to all credit card transactions. Once the payment has been received and approved, buyer can, by appointment, take possession of his or her purchases at the BYDealers warehouse located at 5333 Casgrain Avenue, Montreal, Quebec, H2T 1X3. This must be done within ten days of the auction. The buyer (or authorized representative) must present proof of identity when collecting their lot. Each of the purchased lots will be graciously packaged for manual transport. If you would like to have your lot delivered, BYDealers will be happy to arrange the packaging, handling, and delivery.